Baby teeth, also known as deciduous teeth or milk teeth, represent a major milestone. Once that first tooth peeks through, you probably have some questions about baby teeth order, double teeth, or how many teeth there are. Most of all, how much cash does the tooth fairy give out nowadays? Also known as primary or milk teeth, baby teeth are the first 20 teeth babies get in the first six months to two years of their lives. Because they fall out, they’re also called deciduous teeth, like trees that lose their leaves in autumn. Even before teeth start to come in, it’s a good idea to get into the habit of wiping your baby’s gums after a feeding and before going to bed. This way, your baby will get used to the routine. Why do we need baby teeth? 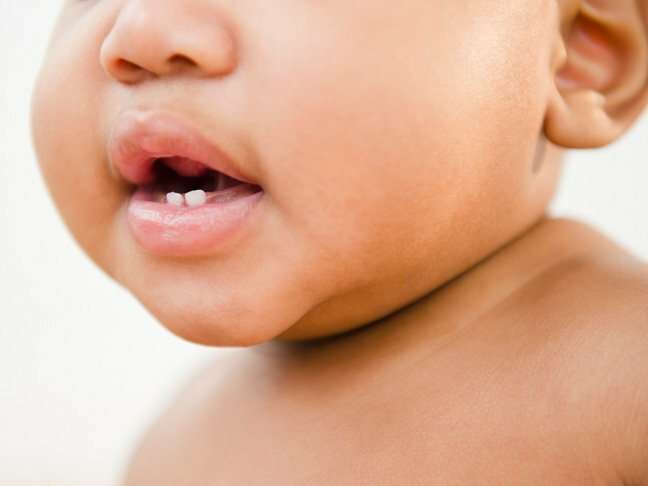 A baby’s teeth break down food, of course, just like adult teeth, but the reason babies aren’t born with a full set of adult choppers is their jaws are just too small. Each tooth acts as a “placeholder” for the adult tooth. That’s why it’s so important to start good dental care early — a baby tooth that falls out or has to be removed can cause the adult tooth to grow in crookedly. How many baby teeth are there and in what order do they appear? There are 20 baby teeth altogether. The first ones to make their appearance, when your baby is about four months old, are the lower central incisors, a.k.a. the front two bottom teeth. Next are the front two top teeth, which will quickly get tooth friends on either side before the corresponding ones on the lower jaw come in. From there, your baby’s teeth fill in from front to back, usually alternating top and bottom. Double teeth are two teeth that are fused together. In tooth development, sometimes one tooth can (incompletely) become two, or two can fuse into one. Depending on your pediatric dentist’s advice, a double tooth can be divided, ground down, or allowed to fall out naturally, but that’s an individual decision you and your dentist will have to make. When will my child start to lose their milk teeth? Children start losing their milk teeth at about age seven and stop by the time they’re around twelve. Their twenty baby teeth will be replaced by thirty-two adult-size teeth that (at least for awhile) may look pretty big by comparison. Overall, going from gummy-smiles to full-faced grins is a great thing to see. As for the really important question (for your child, anyway), the tooth fairy’s going rate is from about $1 to $5 per tooth — but you can always tell your child the fairy pays more for the really well-brushed ones.